Homemaker Highlights: Baby Amber Teething bracelets review. Baby Amber Teething bracelets review. I received these beautiful Amber teething bracelets to review. I received two and decided this would be the perfect review for the Chickaroo Sisters to participate in. We used them as best sister bracelets and set to work wearing them the whole day! They are handmade out of natural Baltic amber. They are lovingly handcrafted by Lithuanian amber artisans with generations of experience. They carefully polish and round each of the Baltic beads. The amber is alive! Yes, it is actually breathing and interacting with the environment. Each bead of amber ages differently and composed of different combinations of plant materials, as well as fossil inclusions. Did you know that science has yet to replicate the chemical signature of amber? That's the reason why it retains it's beauty so well. Wearing amber on the skin can have soothing and calming effects on teething children. One theory is that when amber is worn on the skin, the skin's warmth releases small amounts of healing oils from amber which are then absorbed through the skin into the bloodstream. Another theory suggests, based on scientific findings, that amber is electromagnetically alive and produces significant amount of organic and purely natural energy. Amber has been attributed with protection from illness, enhancement of immunity to disease and infection, and to signify an important exchange between the giver and the gift. They are for wearing and not chewing. These bracelets are more gorgeous in person than my photo will allow to show. My girls adored them! They are beautiful and they loved the interesting facts that came along with this review, as you have read above. We used them as matching sister bracelets and they were worn for an entire day. I must say they received a lot of compliments and the quality is suburb. I loved that there is a knot after each bead and if the event of a break occurred, they prevent the beads from scattering. If you are interested in ordering one of these beautiful bracelets, please use the links above and place an order! Thanks for this wonderful review. Those bracelets are indeed beautiful. 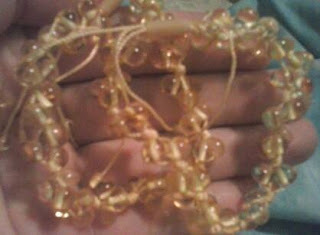 And I love the fact that it is knotted every after bead. It makes the bracelet safe for children.